A collection of the 13 most-popular drum templates I've done, in descending order of popularity. Hope they're useful to someone. The count-ins have been kept. The album cover features a very important drum kit to me. The kit in the photo is *the* kit used by Mel Gaynor on Simple Mind's 'Street Fighting Years' tour. One of my outright drumming heroes and the video - Live In Verona - I wore out watching over and over again. I lusted after this kit for years and years. It is a Pearl MLX in Liquid Amber. I dreamed of being on that stage playing this kit. 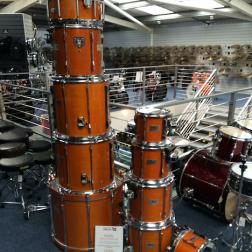 And then I found the actual one for sale in my favourite drum shop. Sadly, I didn't the £2500 laying around to buy it. Gutted. Need more skillets in the kitchen! Here is the master alone with his instrument! Nice skills, playing and overall "Sounding"
Another example of what "sharing" means: give others the best of yourself, think about giving before receiving. Thank you for the time spent for us Martin ! This is a very useful album for many musicians to play with, hey I'm a singer..and with Martin Drums, i can made a song, he have that special skill to pull out your creativity out from your head, and I sometimes can listen and enjoy to his stand alone drums for hours, and well I use some of his track to practice my poor bass play. Thank you for being here Martin! We are so lucky to have you on the Loops Martin! You always give a track what it needs, you have that specialty to get into a track and lift it way up! Not only if you jump into an excisting track (and I can imaging that is what a drummer loves mostly) but also your new templates are way cool for other musicians to jump into! Thank you for all your great music and hope to make a lot more good tracks with you! Great source of great drumming. Always at the top of your game Martin! Thank you for all the great drums tracks and collaborations! As a hobbyist I've only had the chance to play with live drummers a couple times otherwise I'm practicing along with the drum machine which is good but rather sterile and can contribute to my getting stuck in a rut. These drum tracks are a breath of fresh air. So grateful that you put this out here for us. It's really gonna help me take my playing to the next level and help get stuff out when I have creative constipation. Many thanks and keep on jammin.. These are some amazing beats. It feels like Christmas. Perfect for riding my bike with some earbuds.